Over the weekend, I got a call for an order of a couple of anniversary cakes. This client was very easy to work with. She wanted something floral on a white background, she was also okay with me using fresh flowers if I was short on time. 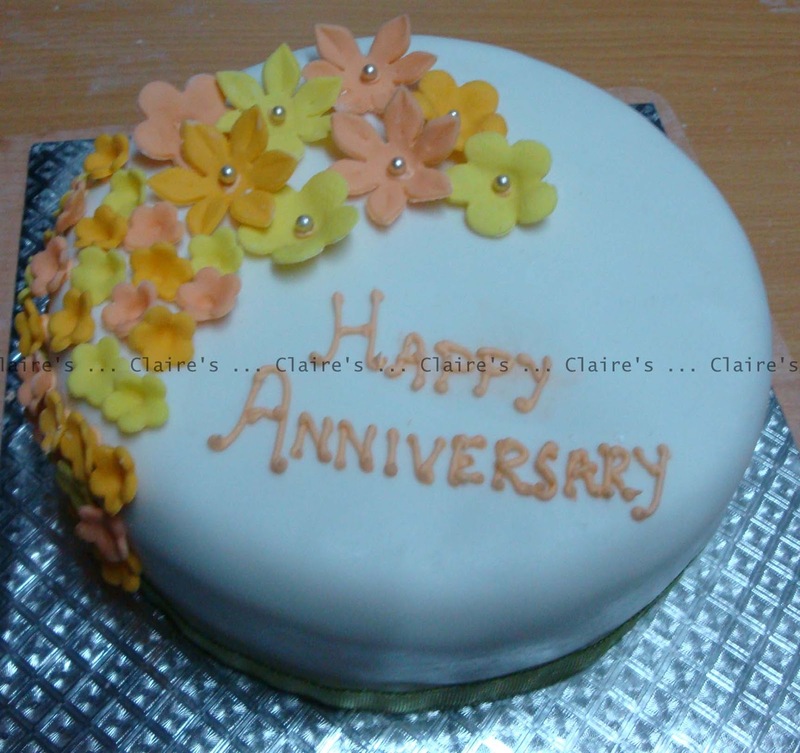 It was very short notice since she needed the cakes for Monday evening so I had to stick with something simple yet pretty to look at. 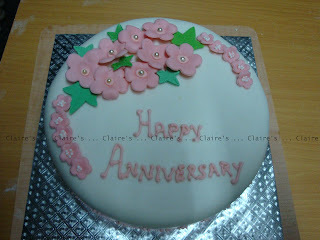 Since she was so understanding of the short notice, I decided to go all out and do simple sugar flowers for her anyway. Well, that meant a super busy day and a late (**yawn**) night. But I must say I was pleased with the outcome. 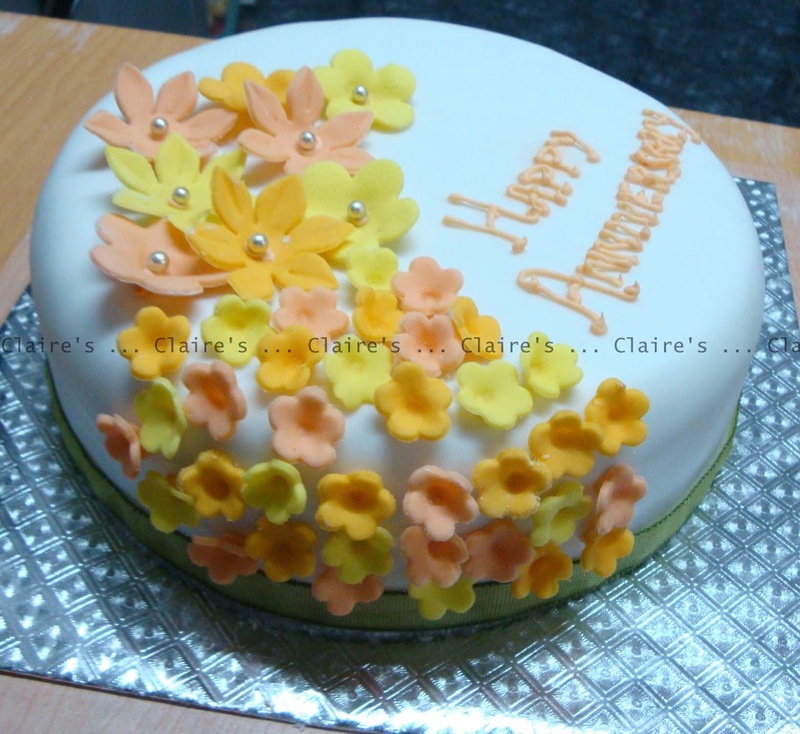 Never had I imagined that such simple blossoms could lift a cake from being plain to something pretty. And the best part is, she loved them. Client delight (not just client satisfaction) is what makes it all worth it. Everything was made from scratch. The base was a rich, dark fruit cake, covered with a layer of homemade marzipan and homemade fondant. 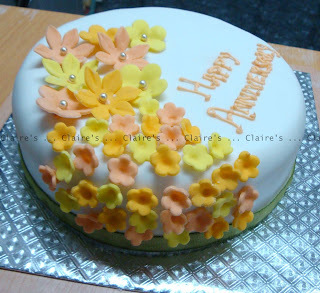 The flowers were made of fondant. I was free to use any colors I wanted. So for the first cake, I opted for some bright spring - summer colors. For the second cake, I went with pink. One can never go wrong with pink. These are two beautiful cakes! I assume you don't deliver in Greece right? lol. These are beautiful! congratulations on creating such pretty cakes! That is GORGEOUS!!!! So lovely! Beautiful cakes! 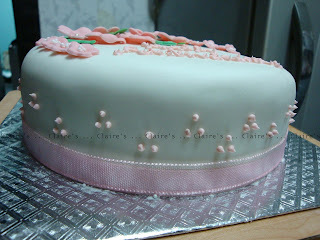 I love the color palette of the first cake especially, and the silver dragee embellishments! What gorgeous cakes, my dear - thanks for entering to my event! Thanks Priya ... I'm glad I stumbled onto your blog! Wow - the cake looks great... do u use readymade fondant or make it? Koolgirl, I haven't come across readymade fondant in Mumbai atleast, I make mine at home! Thanks Kool Girl, drop me an email and I'll reply with the details!